Lets you know whenever any new Web pages appear on this Cheap Computer Web site. Informs you about new cheap computer deals, new articles, tips and tricks and any other information that I think might be of interest to you. To subscribe to my Cheap Computer Blog (no e-mail necessary), right-click on the orange RSS button (see buttons at the bottom of the navigation bar - left) and then paste the URL into your RSS reader. Or, click on the Google, My Yahoo!, My MSN or Bloglines button if you keep a personalized home page. Once you start, you will be amazed at what RSS can do! Have fun! Continue reading "Shopping Online for Cheap Computers and a host of other Consumer Items"
Continue reading "Surge Suppressor and UPS Backup System Guide"
Continue reading "Static Electricity and Your Computer"
Continue reading "What are Solid State Drives?" 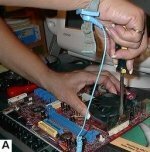 Continue reading "Cheap Computer Printer Guide"
Continue reading "Modem Guide - Connecting to the Internet"
Continue reading "Cheap Computer Software Guide"
Continue reading "Build Your Own Cheap Computer Resources Links"
Continue reading "Cheap Computer Protection Guide"
Continue reading "Cheap Computer Motherboard Basics"